I tried a new crochet hat pattern this week. It is the Stay Strong Beanie pattern from Elk Studio. I crocheted this hat in Knit Picks wool yarns with an I (5.25 mm) hook for the 2019 Warmth for Warriors hat drive. I used wool yarn from my stash to match the color scheme as close to the written pattern as possible. I did find that working even on 60 stitches did create a small head dimension. My finished hat circumference is 20.5 inches. The hat fits me so it should be okay for a smaller adult head size. I also had to add several additional rows of single crochet (SC) stitches to get a length of 8 inches long which is needed for the hats for the Warmth for Warriors. After 7 rows of SC, I finished off my hat with the reverse SC or crab stitch. When I work the hat pattern again, I think I will work even on about 65 stitches to make my hat larger next time. Here is a Dollar Store towel and 2-potholder set. I took these Dollar Store items and added some crocheted cotton to spice them up. The brown Dollar Store towel was folded in half and a waffle towel topper pattern was added to the top. 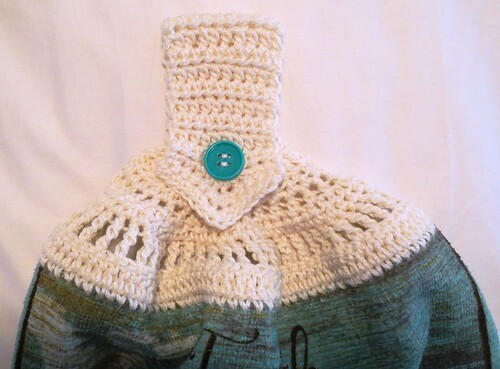 The free double layer waffle towel topper pattern can be found here. Super easy with no cutting, sewing or other prep needed before crocheting the towel topper onto the towel. 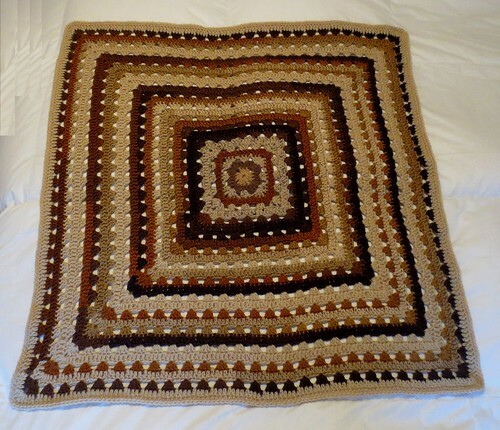 Another Ravelry member of our Warmth for Warriors group introduced me to this Grannies Square blanket pattern. The pattern from Doug Speeckaert features a repeating 2-row granny square pattern which looks great and lays flat. The free crochet pattern link to the pattern can be found here. 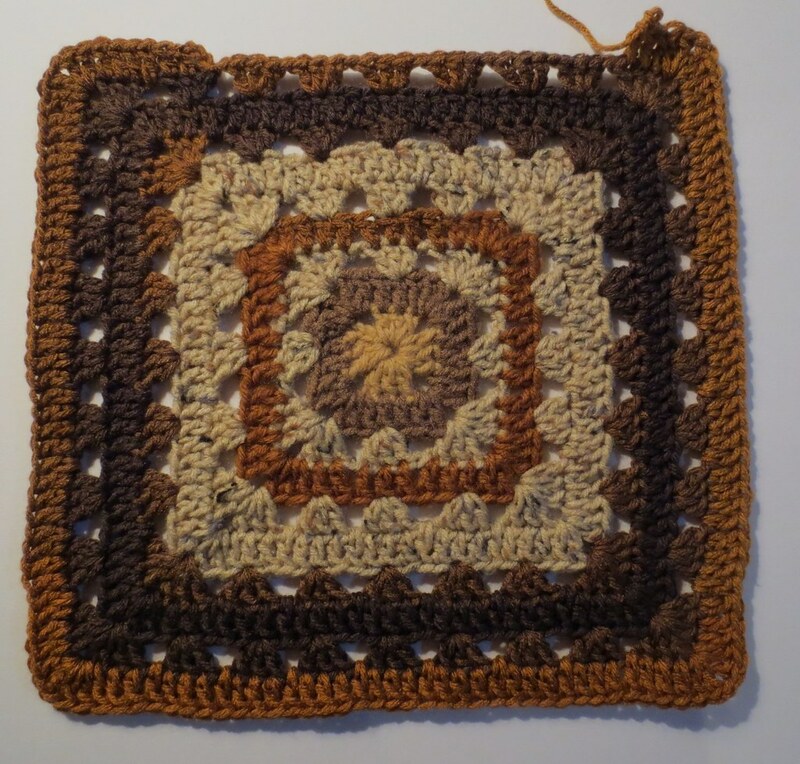 In this next photo of the center, you can see how you do a traditional granny square type stitching and then the next row is a fill-in row of double crochet stitches. I think this really helps to allow the blanket to lay flat and not ruffle. The pattern works nicely for using scrap yarns for each row and then I crocheted a few rows in the same color of yarn to create my blanket. I also used two skeins of Red Heart Stripes in latte stripe for the first blanket. 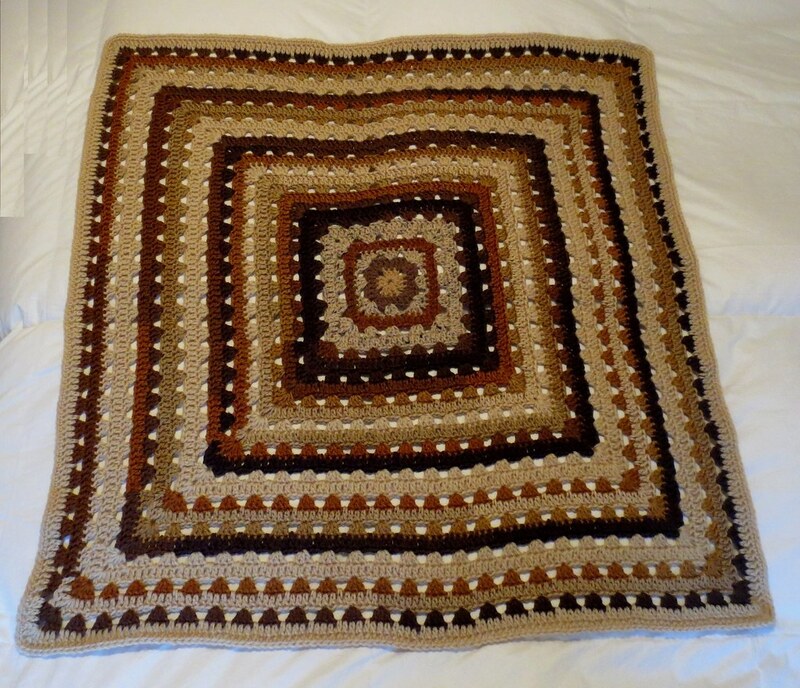 I crocheted both of my blankets to a lapghan size for use by Veteran’s in wheelchairs. Both blankets are 32 inches wide. Crocheted towel toppers are an excellent charity item. They are quick to crochet and are a desired item for charity fundraisers. They also make excellent gifts. I have several different free crochet patterns for making towel-toppers. Here is a link to all of my towel topper patterns. The next few towels use the pointed-handle towel topper pattern. 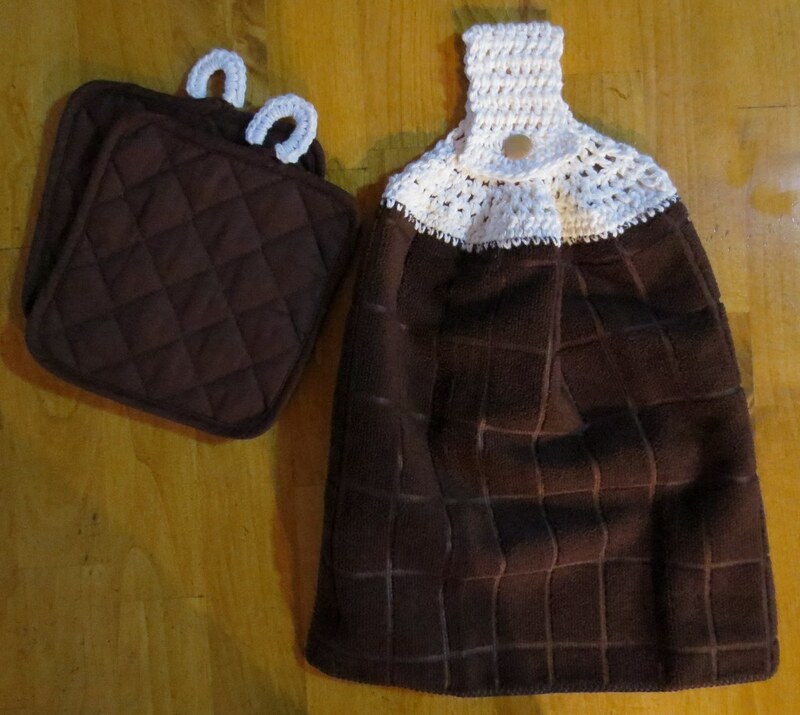 These dollar store towels which once you add the crocheted towel-topper, really make a nice handmade gift. Another is one of the new Christmas towels at the Dollar Tree, which makes a great candidate for a towel topper as shown here. The jingle bell closure adds a bonus for a Christmas-themed gift. 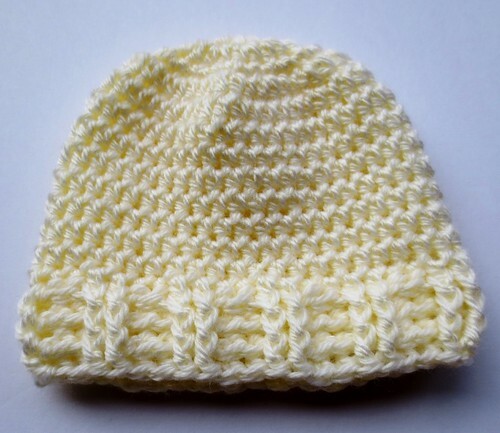 Here is a new crocheted baby hat pattern to share. 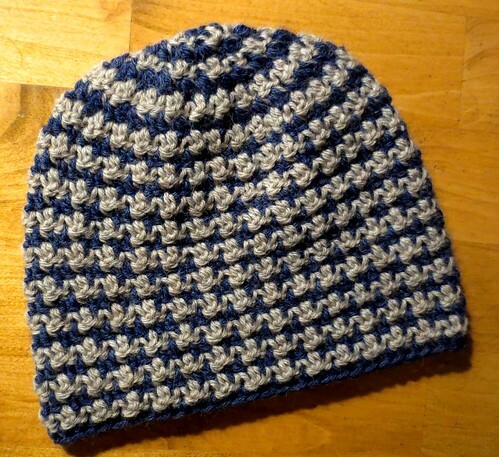 It combines a scalloped edging that I have posted before but I added it to a hat mainly worked in the round. I like this crochet pattern as the hat doesn’t have the normal joining. Therefore it doesn’t have the noticeable line running down the back of the hat where the joining was made. 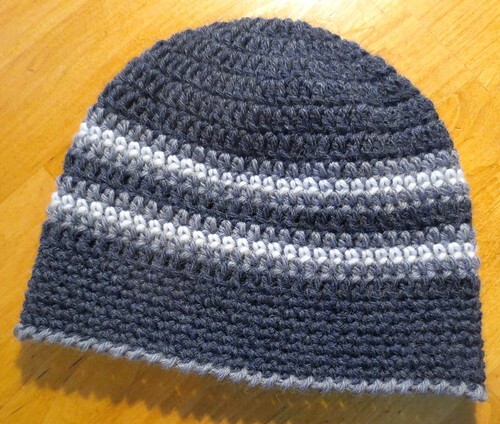 Below you will find the free crochet pattern for this hat. Please use it freely for gifts, charity and fundraisers. If you use a contrasting yarn for the scalloped edging, just join the new yarn and chain 1 on the inside edge of the hat. Then work the scalloped edging instructions as written. I won this Houndstooth hat pattern through a raffle on Ravlery. I wanted to crochet the pattern in wool yarns for the Warmth for Warriors hat drive. Here are the two wool hats I have crocheted so far with the pattern from Liz McQueen. It is not a free pattern but I was fortunate enough to win it as otherwise it is $4.50. I do think the pattern is well written and includes many step-by-step photos to help a person crochet the hat. The pattern calls for a I (5.5 mm) crochet hook. I used a smaller H crochet hook so I found the hat a bit short so I added more rows to achieve an 8 inch long hat. 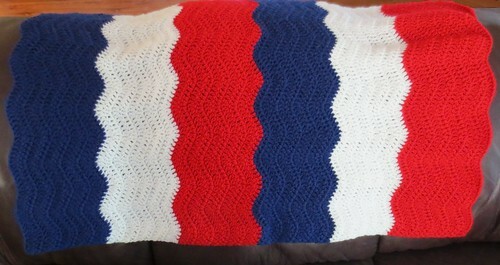 I just finished up a RWB (red, white & blue) wavy ripple lapghan for this year’s Warmth for Warriors blanket drive. In case you are not aware of the organization, Warmth for Warriors collects blankets, lapghans, hats, and mini Christmas stockings each year for our troops and Veterans. If you love to knit or crochet and would like to support our soldiers, come check out our group on Ravelry. Here is my wavy ripple that I crocheted in a lapghan sized blanket. I used this wavy ripple blanket pattern and chained 107 stitches to start. I used an I (5.5 mm) crochet hook along with skeins of red, white, and blue Red Heart jumbo yarn. I probably only used about half the jumbo skeins for this project as I still had at least half a skein leftover in each color when I finished. We are just wrapping up our Christmas in July stocking along over at Ravelry. 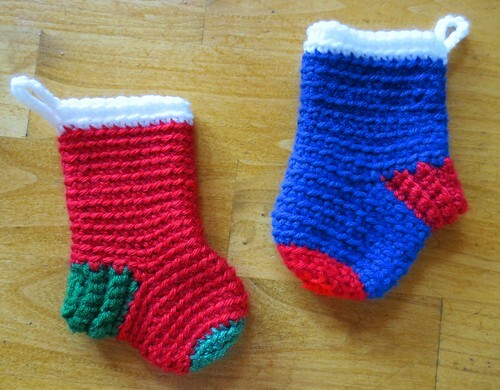 I crocheted about 20 different mini Christmas stockings over the 2 week event. Here are a few of my completed stockings which are for the 2018 Warmth for Warriors stocking drive. These were crocheted using the BLO (back loop only) mini stocking pattern. Working in BLO has become one of my favorite methods these days. It is easier on my hands and fingers and the projects do seem to work up more quickly. Here are two BLO stockings that I crocheted in stripes. You just work 2 rows in each color and carry the yarn on the inside after you change colors. This allow you not to have a bunch of ends to weave under later and makes for a cute little Christmas stocking.